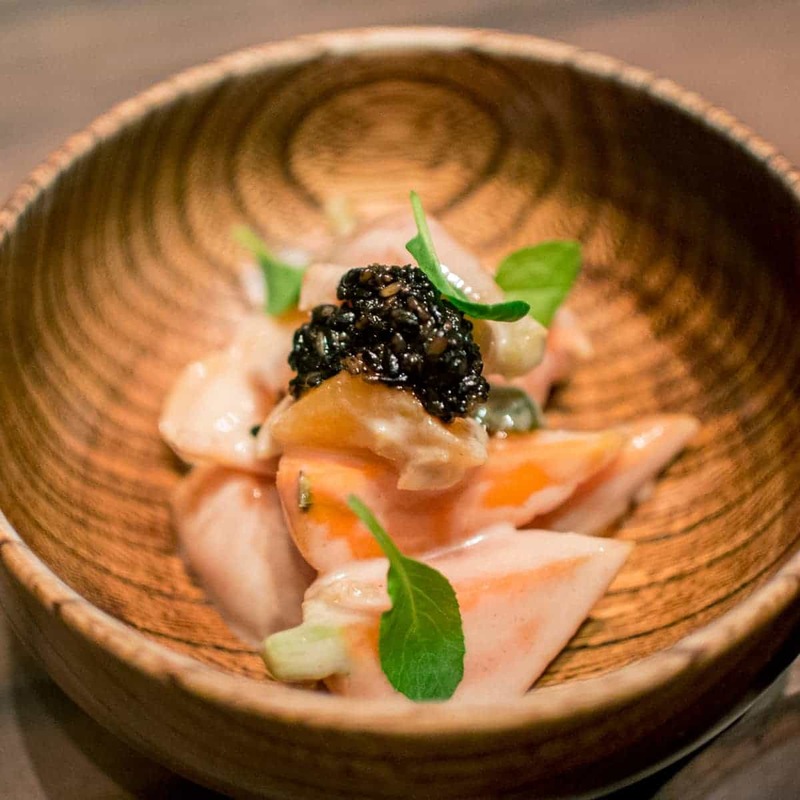 Despite its high-end concept and rather expensive price point, they do manage to keep the entire experience quite approachable and not stuffy, unlike many other tasting menus at this price point. 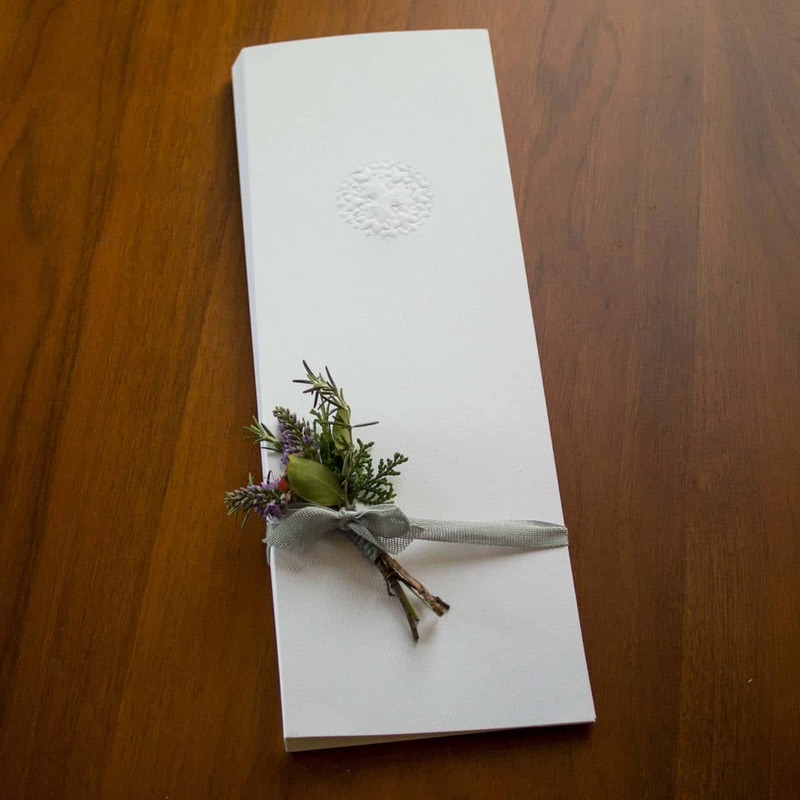 Still, you’ll definitely want to save this one for a VERY special occasion based on cost alone. 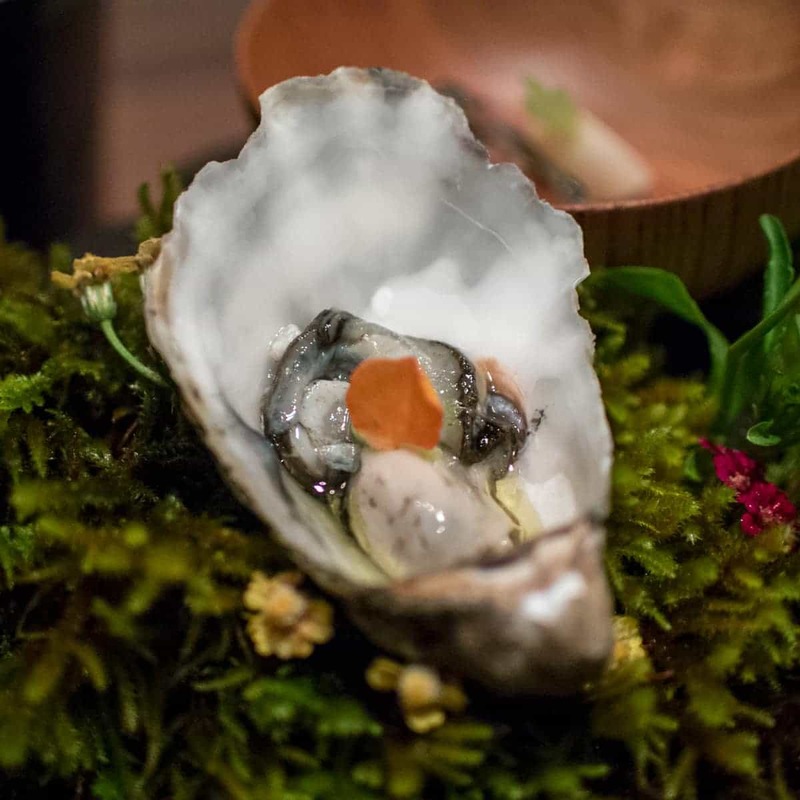 A 10-course tasting menus costs $255 per person (which comes to around $295 with tip included) and the wine pairing add-on costs $155. 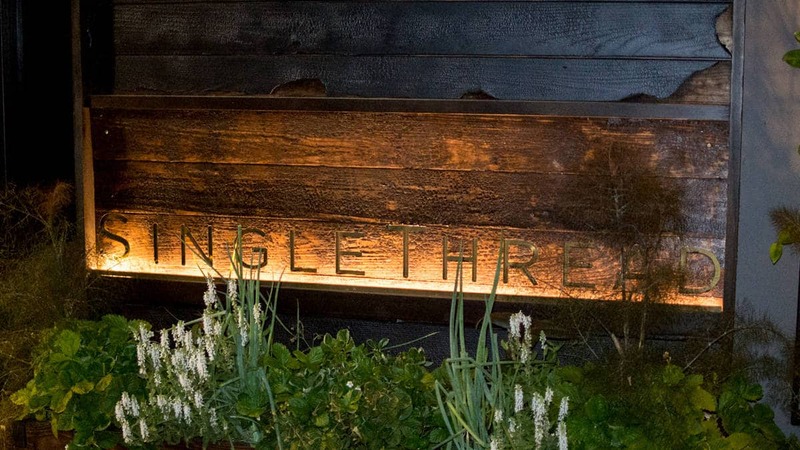 We visited Single Thread to celebrate our one-year wedding anniversary with a bang. 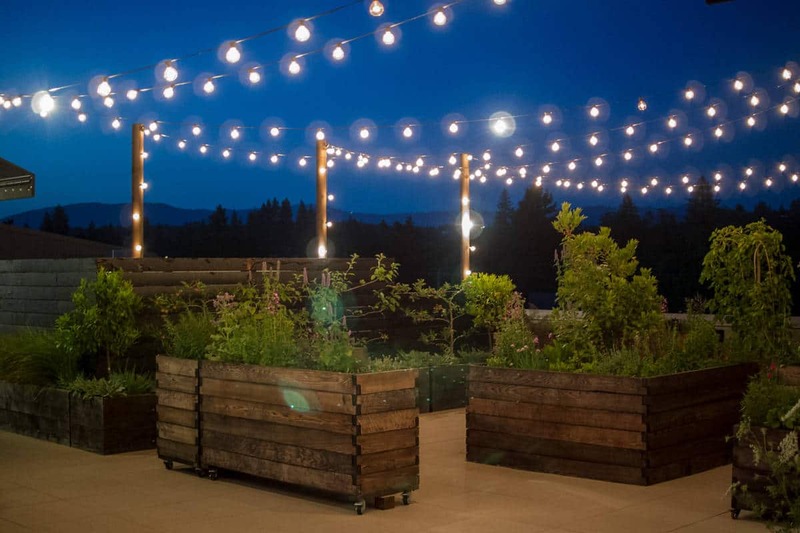 Conceptually, this restaurant focuses on seasonal, farm-fresh dishes frequently leveraging their rooftop garden to construct and plate dishes. This place doesn’t exactly have a menu. Instead, they build a multi-course meal based on what’s in season and fresh with your pre-submitted feedback on food allergies or aversions. We requested no parsnips or sunchokes — the former which tastes soapy to us and the latter which reacts extremely poorly with my digestion. 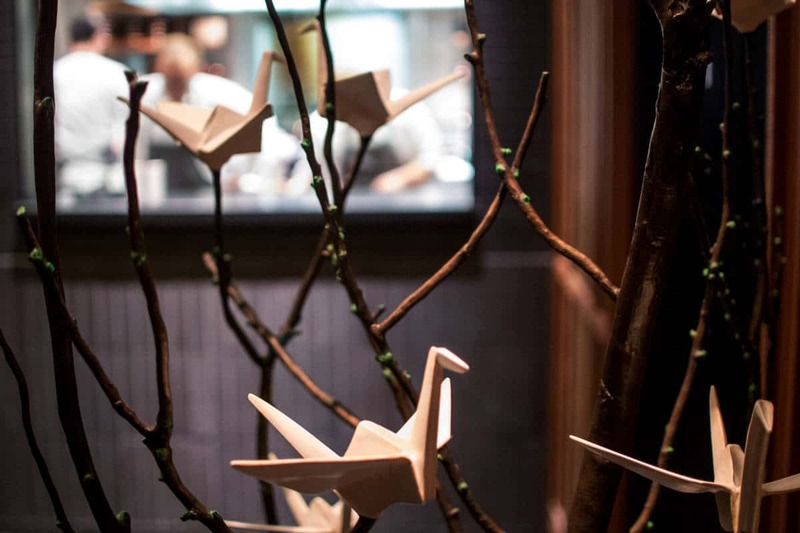 Both the decor and the format of the dishes have a noticeably Japanese sensibility. 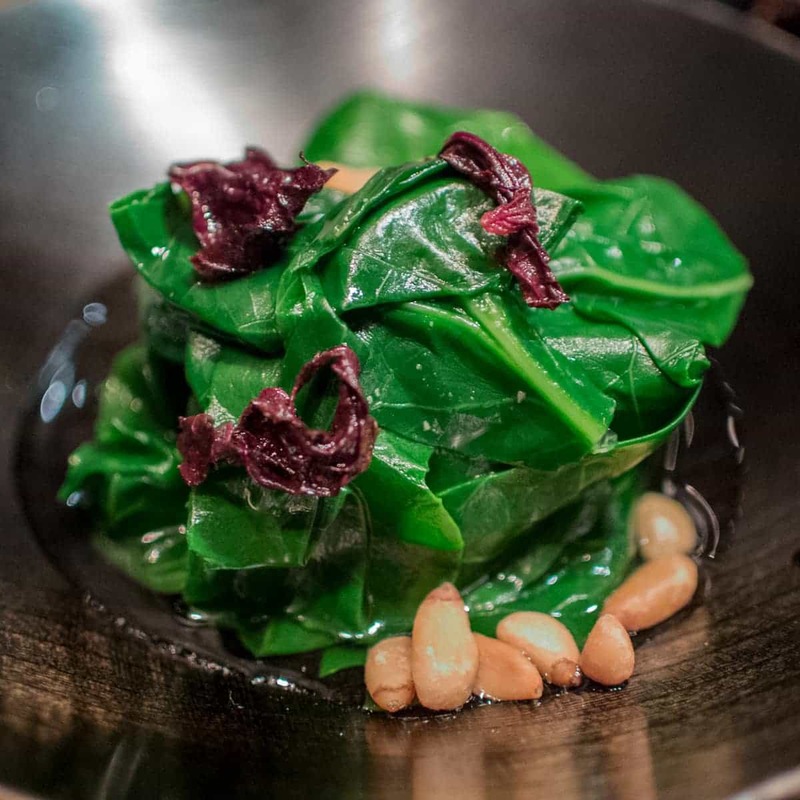 In fact, they include many Japanese cooking techniques, cookware, and even partake in the traditional hot hand towel ritual of oshibori throughout the meal. 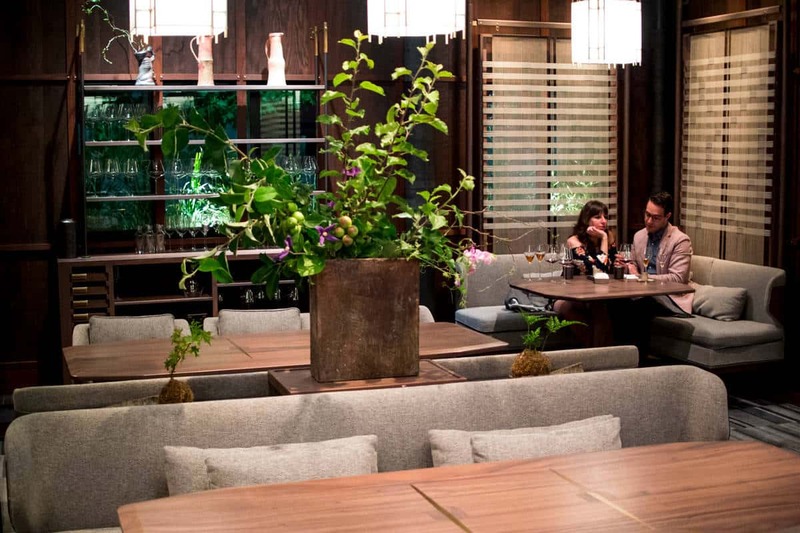 If I were to describe the look of the restaurant, it would be a cross between traditional Japanese and mid-century modern styles with just a touch of industrial thrown in. Everything about this place exudes stylishness, hospitality, and extreme attention to detail. 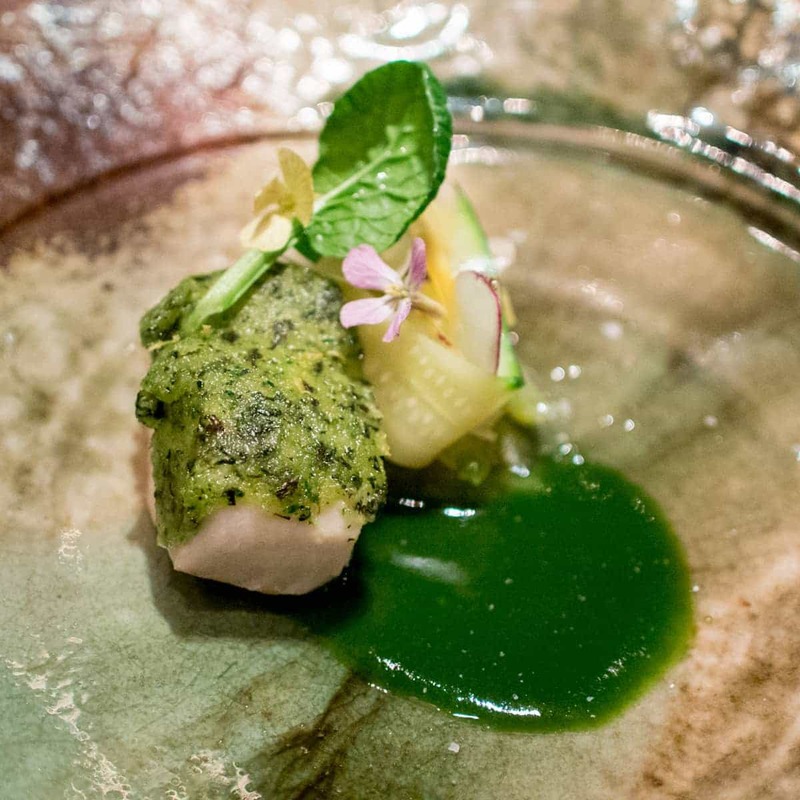 It’s definitely a restaurant best saved for special occasions, but in my opinion, you really need to experience this type of personalized, attentive fine dining at least once. It was just extraordinary in every way. Interestingly, your meal does not actually begin with a seating at your table. 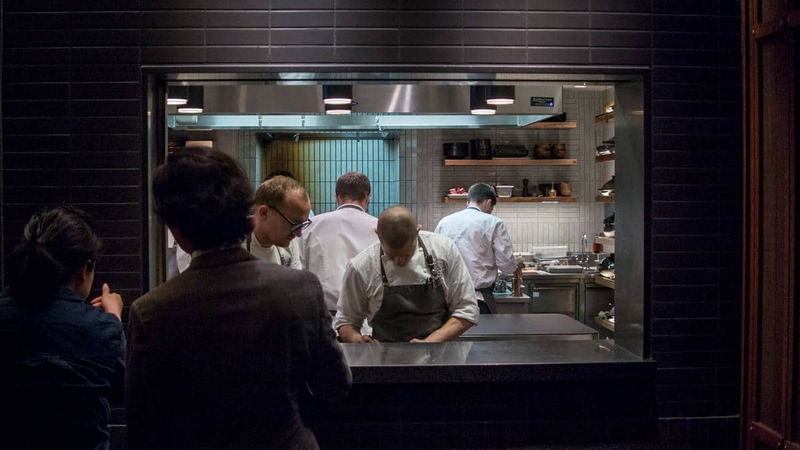 First, upon entering the restaurant’s lobby, you are directed to a window looking into the bustling kitchen full of chefs executing interesting cooking techniques and using plenty of culinary tweezers for precise platings. 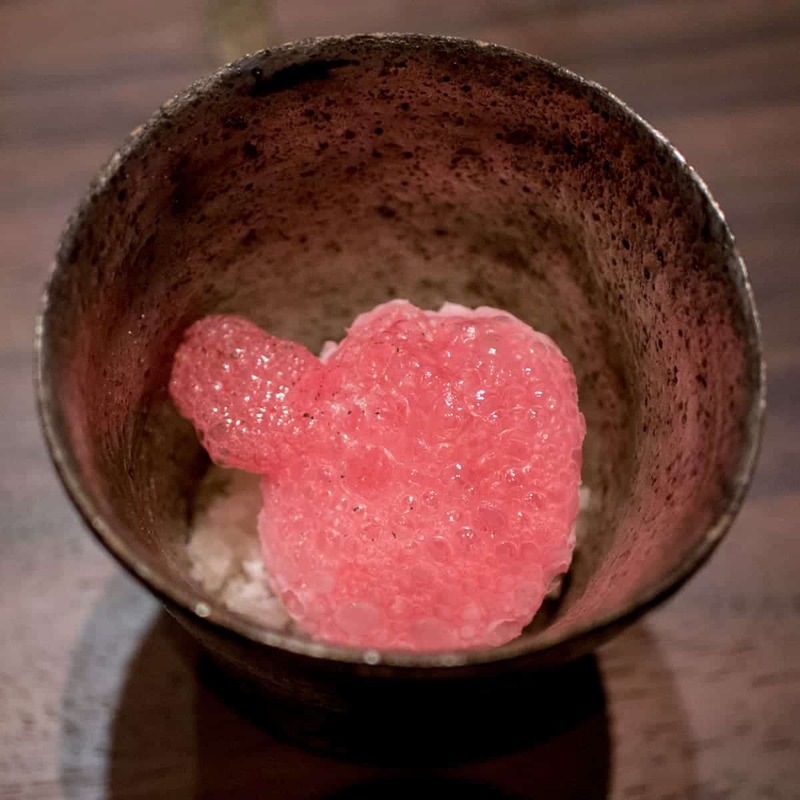 At the window, we were presented with an opening beverage — an Anise Hyssop Sweet Potato Drinking Vinegar. It was mellow and very light, a soothing start to the lengthy meal ahead. 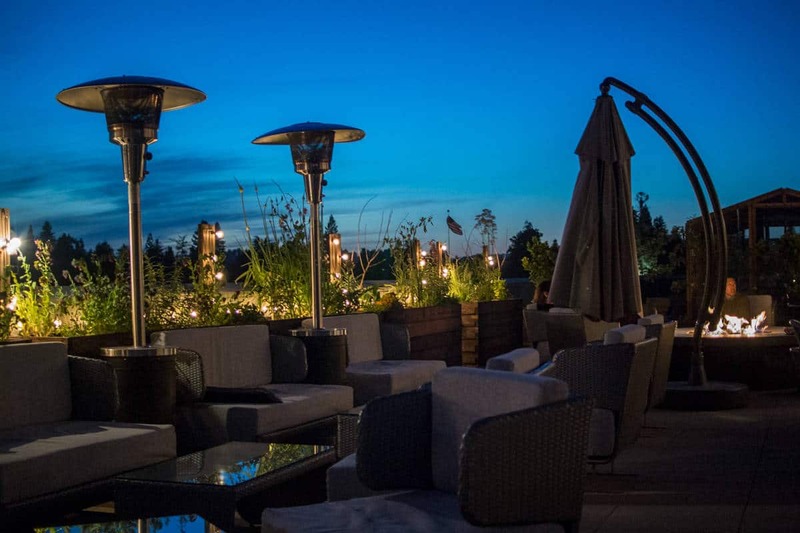 From there, we were led to the lobby elevator and taken up to the third-floor rooftop where they grow many of the herbs and vegetables used throughout the menu. Here, we were offered the opportunity to order an aperitif to drink with our first few small bites. 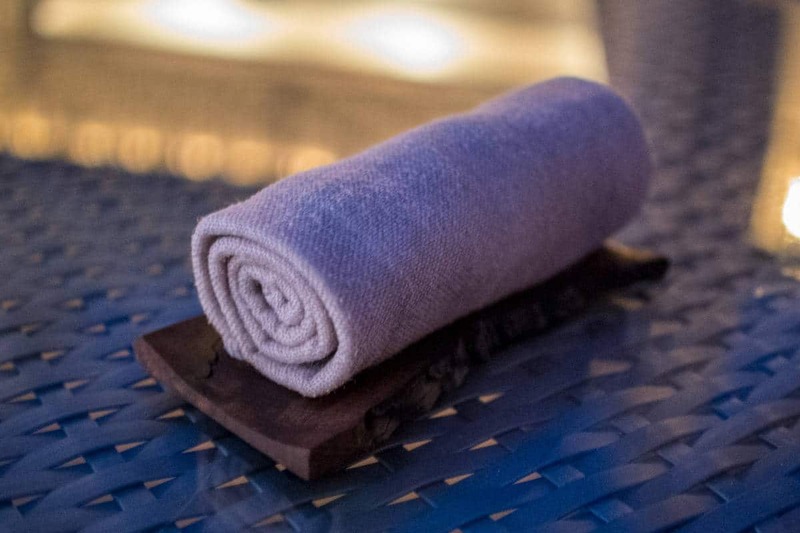 We were also presented with a hot towel to cleanse our hands as part of the traditional Japanese ritual of oshiburi — a really nice touch. At this point, we were introduced to the first of the many — yes, many — sommeliers we’d be meeting during the evening. Amy selected a remarkable sparkling wine that came highly recommended by the sommelier — a 2005 Pascal Doquet Champagne Brut 1er Cru Blanc. I’m not a particularly large fan of champagne or other sparkling wines, but this selection was honestly the most incredible bubbly I’ve ever tasted. It was dry, earthy, easy to drink, and quite complex in a way I’ve never experienced before. 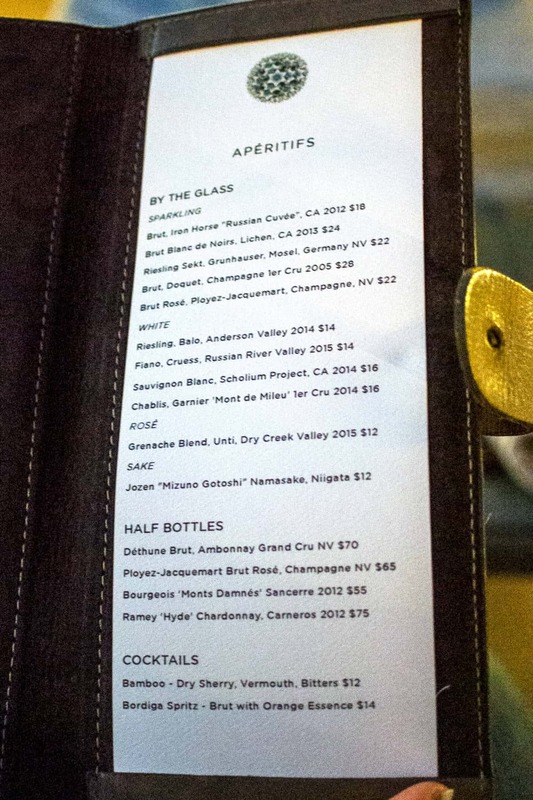 I selected an aperitif cocktail called the Bamboo which I absolutely loved. It was very complex with a bit of a cigar box flavor profile. 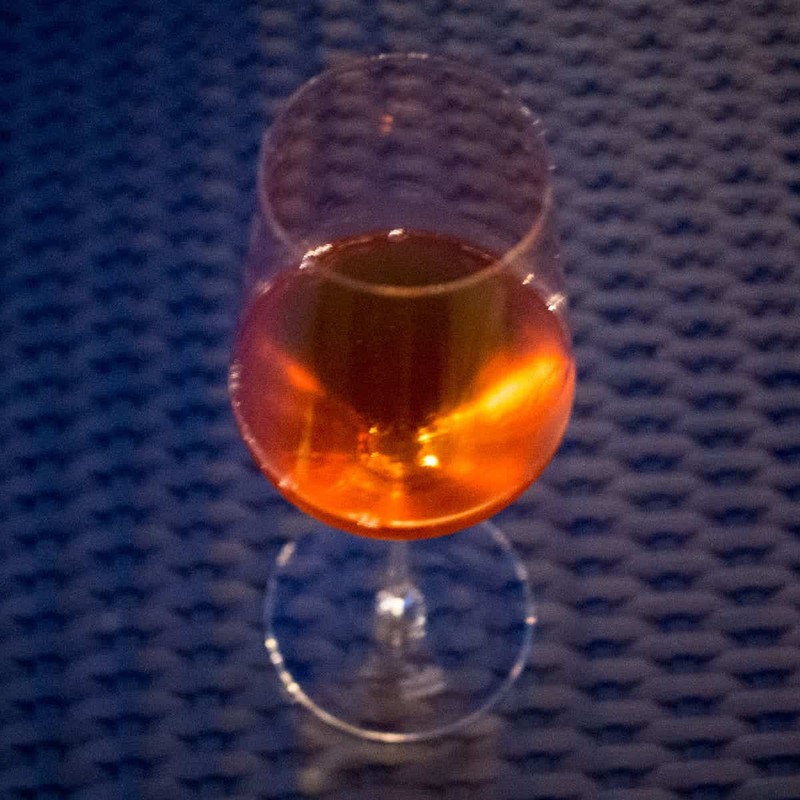 It was served ice cold and tasted strongly of the dry sherry, vermouth, and bitters that made up the drink. 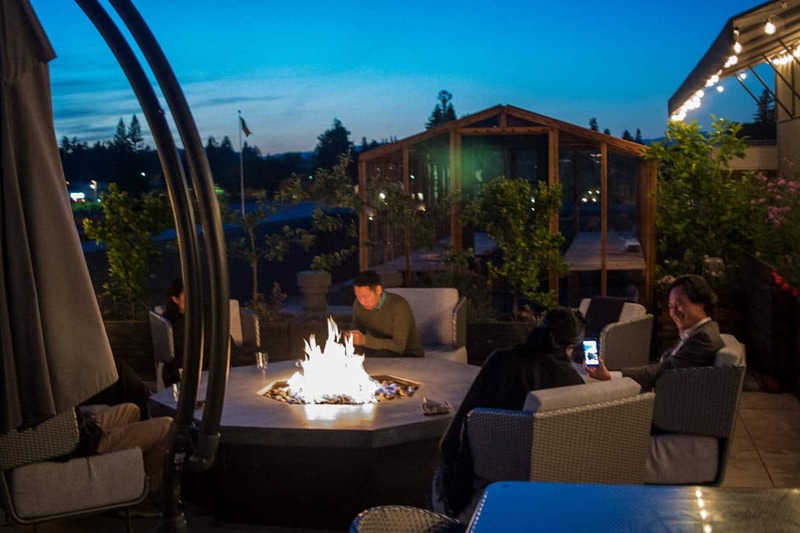 It was absolutely wonderful to sip on that gorgeous rooftop under the heat lamp warmth and starlit sky while enjoying the trio of initial bites. 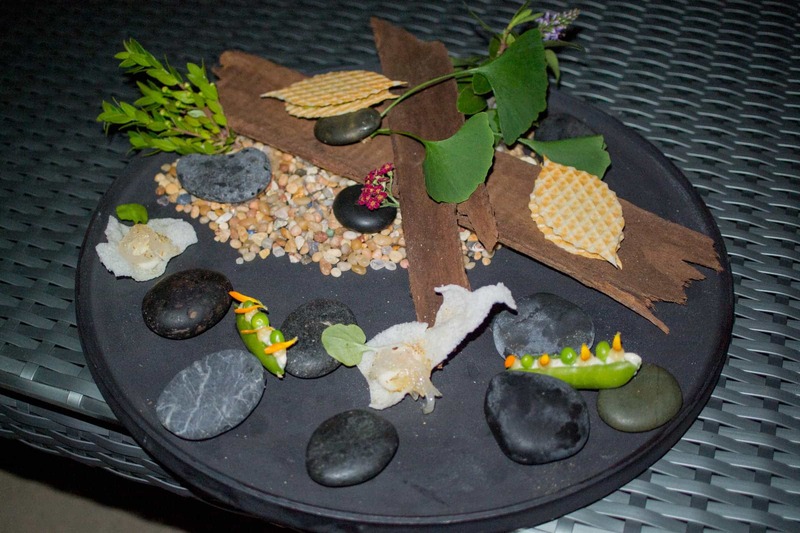 This trio came impressively plated on an arrangement eucalyptus bark, stones, moss, flowers, and other local beauties directly plucked from nature and the restaurant’s garden. This one-biter involved a crispy puffed cracker topped with a cluster of stringy onions that were rich like french onion soup. Remarkably, nearly five seconds after popping the chip into my mouth, the onion flavor intensified — it just exploded with deep onion sweetness and complexity. Utilizing green peas sourced from the restaurant’s garden, this veggie bite was crisp and snappy. It also had a creamy fromage blanc filling that provided a gigantic herbal hit that cut through the vegetal pea and rich dairy flavors. This tapioca-based cracker sandwich had a crisp texture and a nutty rice-like flavor. 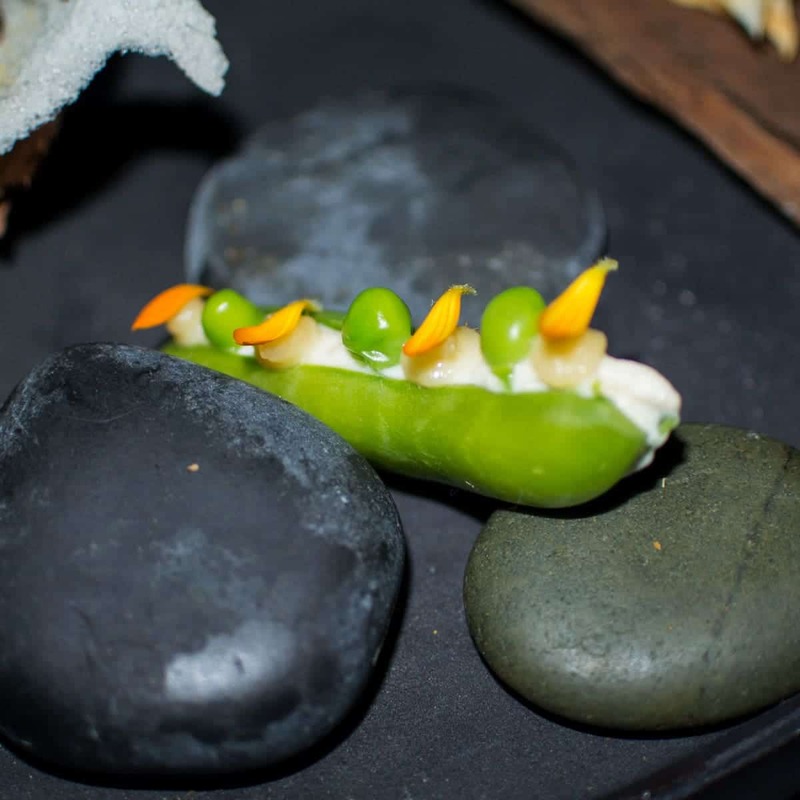 The greenish filling was creamy and added an unexpectedly slightly vegetal note to the bites. At this point, we were led back to the elevator bank and taken to our table that was already prepared with a veritable cornucopia of small dishes plated upon mossy logs and in a variety of interesting hand-crafted cups, plates, bowls, and other vessels — handmade by The Nagatani Family of Iga, Japan who are 8th generation master potters. At this point, the second sommelier came over and guided us through the many beverage options available to us. Pretty quickly we decided upon the Nightly Pairing of wine which had been custom designed to match the personalized and daily-changing menu for the evening for $155 a head. Yes, a definite splurge, but undoubtedly a worthwhile one. This was definitely the most considered wine pairing I’ve ever experienced and truly complimented and elevated each of the dishes throughout the meal. This spread was titled “Late Spring in Sonoma County”. I didn’t catch exactly what all of the dishes were, but to the best of my knowledge, they included: Tempura Maitake Mushrooms, Marinated Gai Lan with Pine Nuts, Tofu with Garden Vegetables, Asparagus with Smoked Miso (the mustardy miso dipping sauce was crazy good and the fresh asparagus was super-snappy), Hamachi Crudo with Edible Flower Petals, Baby Strawberries (Amy claimed that they’re like nature’s Gushers), a Skin-on Fish over a Green Puree, Sashimi, Ahi Tuna Crudo with Gelée, Pickled Kumamoto Oysters with Wasabi, Caviar-topped Egg Velouté, Artichokes, and a super-silky Potato Puree. 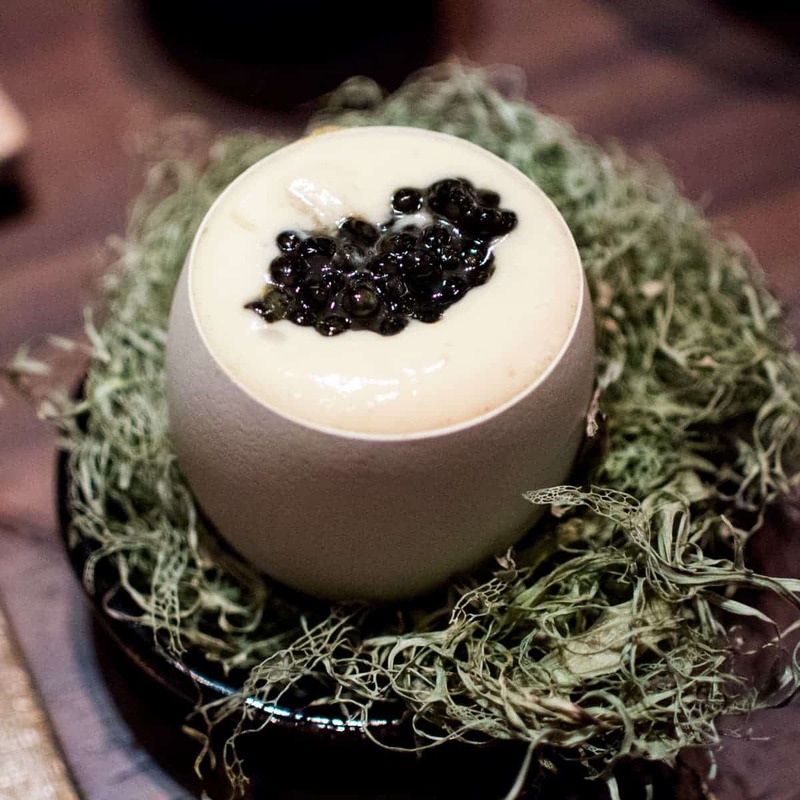 All of the plates were outstanding, but the Caviar-topped Egg Velouté served in an eggshell on a mossy nest was one of the most incredible things I’ve ever eaten. Utterly decadent in its creamy richness accented by the salty, briny, bite of caviar. These were all paired with a sweet, musky glass of 2014 Domaine de l’Ecu “Gneiss” Muscadet Sevre et Maine from the Loire Valley in France. Once we finished all of the components of “Late Spring in Sonoma County” and its paired wine, we received our next set of courses. 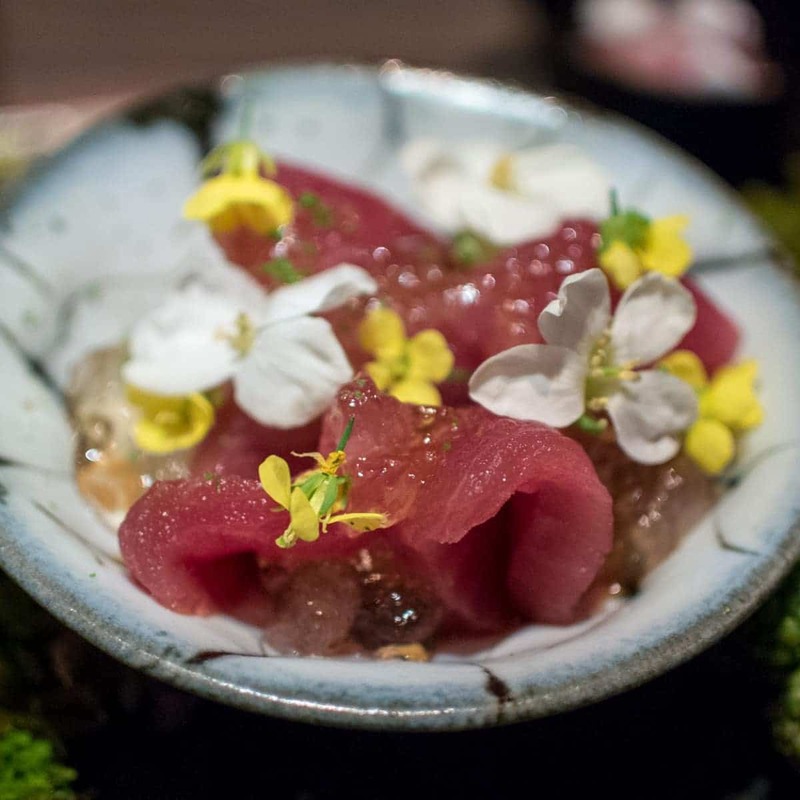 This was an extremely delicate sashimi dish and it was absolutely incredible. 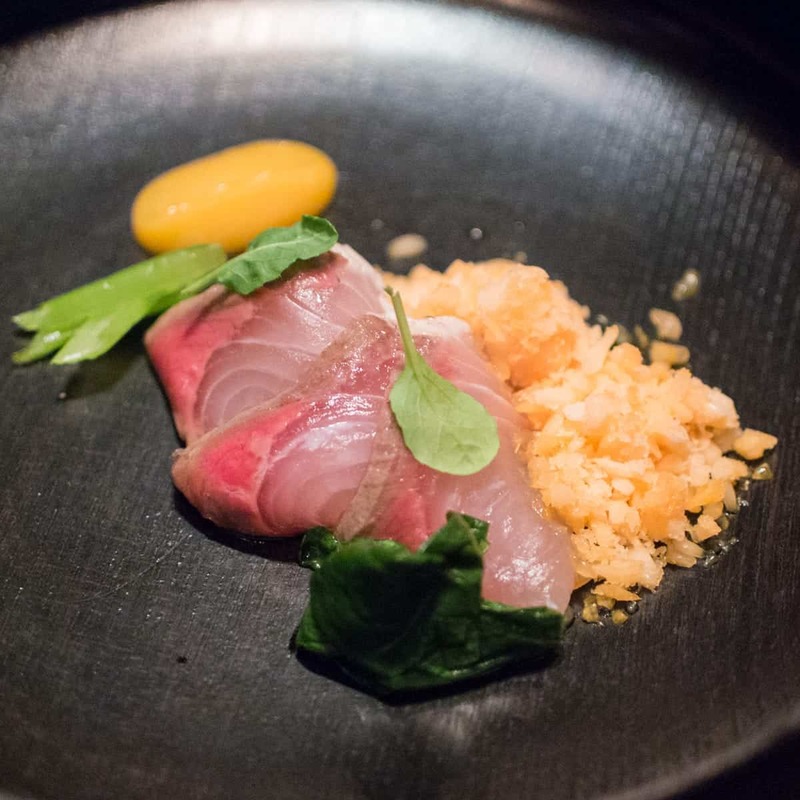 The raw sliced fish was lightly dressed in barrel-aged ponzu and served with freeze-dried tangelo pulp, tatsoi greens, and a saikyo (white, smooth) miso sauce all of which added nice contrasts of texture and temperature to the dish. It was especially nice when all of the elements were combined into a single bite. It was paired with a light, crisp 2015 Rudolf Trossen “Hubertuslay” Riesling Auslese from Mosel, Germany. 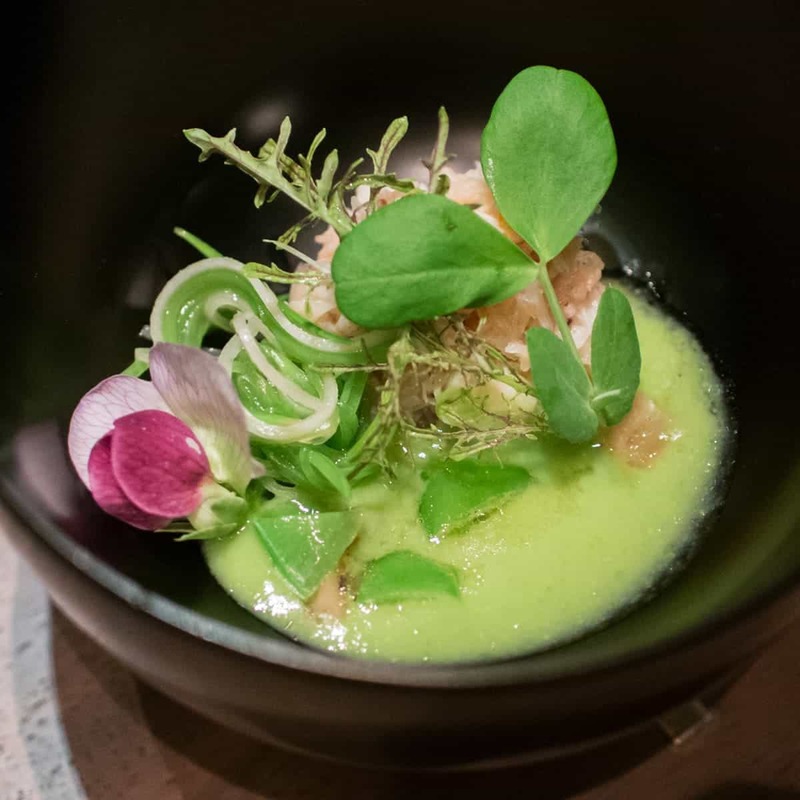 The base of this dish was an extremely vegetal sugar snap pea puree which paired perfectly with the generous portion of super-sweet Dungeness crab on top. 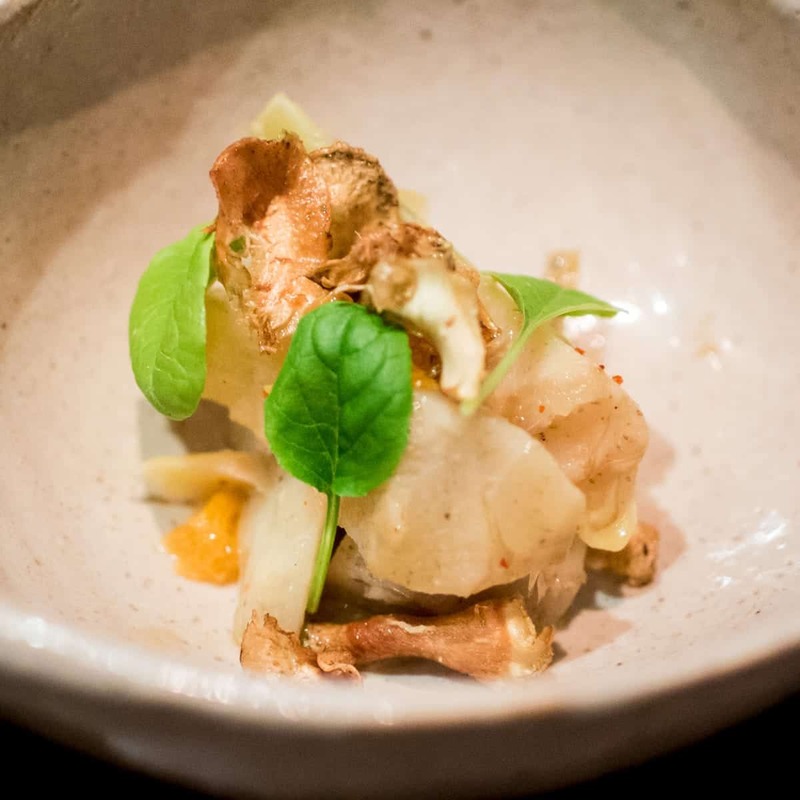 Crisp fruit and vegetable shreds including preserved lemon and salsify added a welcome textural contrast to the dish. It was paired with a fairly light 2014 Dagueneau Blanc Fume de Pouilly from Loire Valley in France. 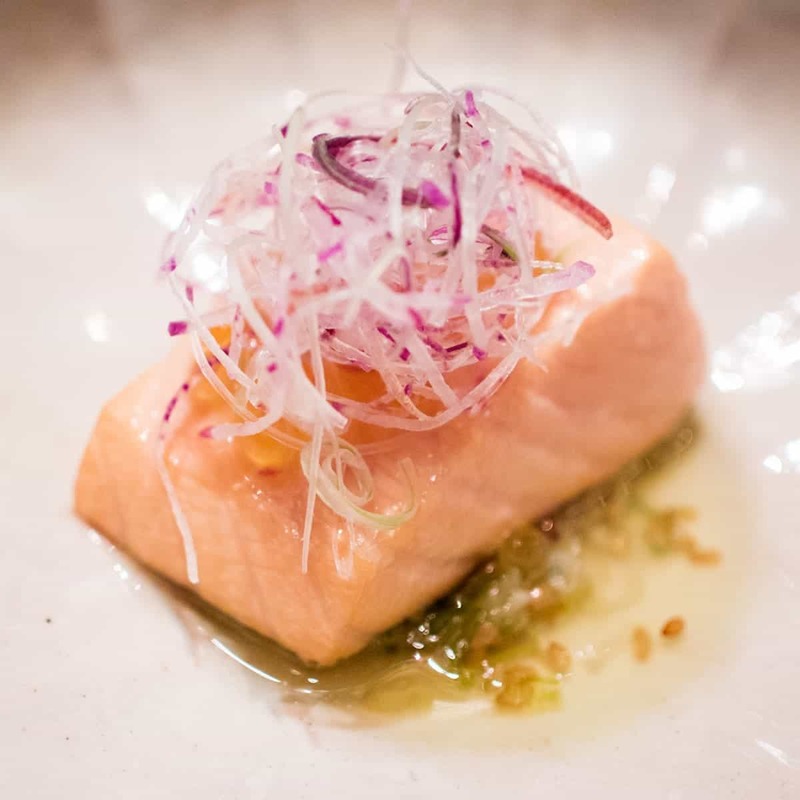 This salmon dish was cooked in a traditional Japanese method using a cooking vessel called an Ibushi-Gin made specifically for smoking. 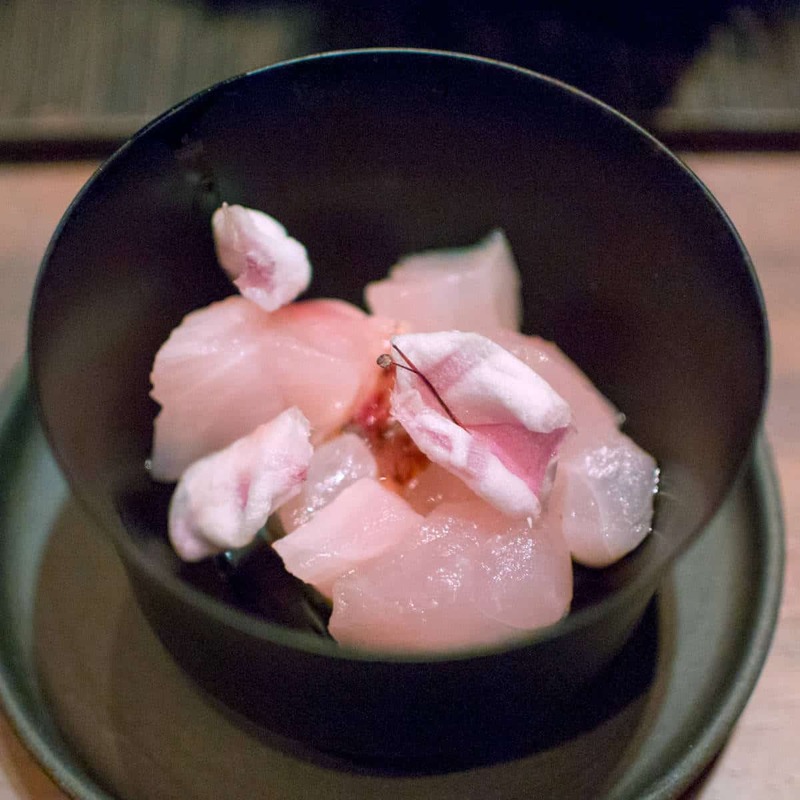 The fish was absolutely luscious — delicate in texture and flavor, but with a very present smokiness throughout. 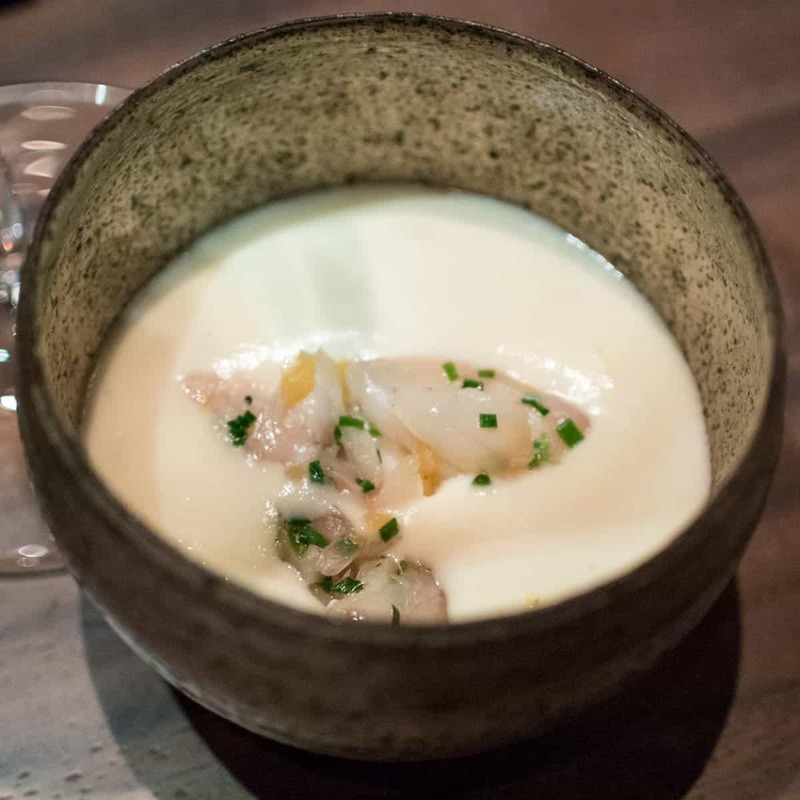 It was served with a Shio Koji (a mixture of malted rice, salt, and water) Viniagrette and came topped with Artic Char roe which added a light brininess. 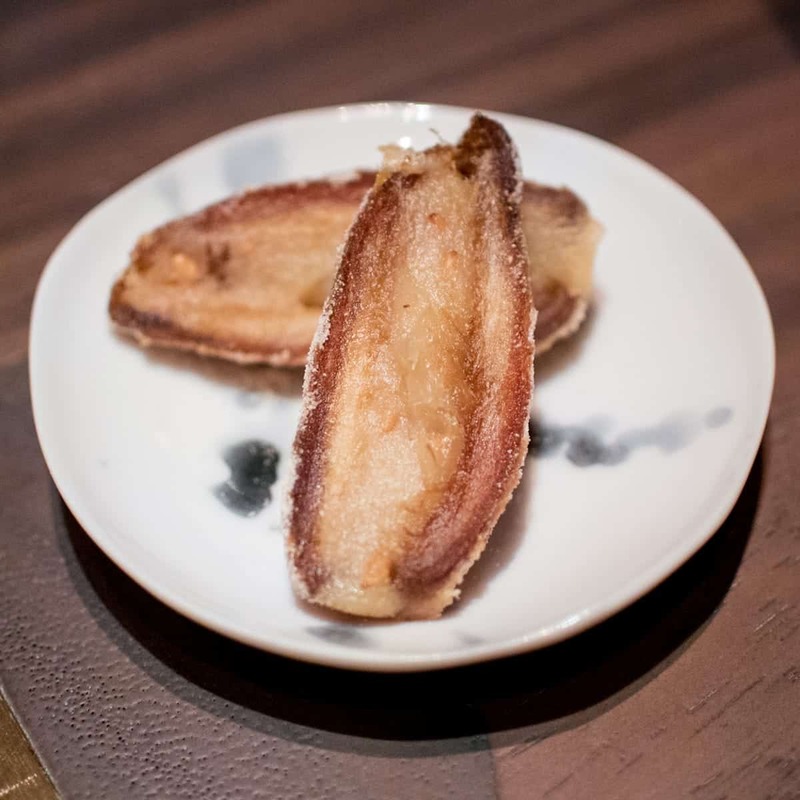 Also, the dish had a nice textural crisp from the shredded Myoga (Japanese ginger) on top. It was paired with a tight, bubbly 2010 Carciccioli Brut Rose sparkling wine from the Santa Lucia Highlands in California. 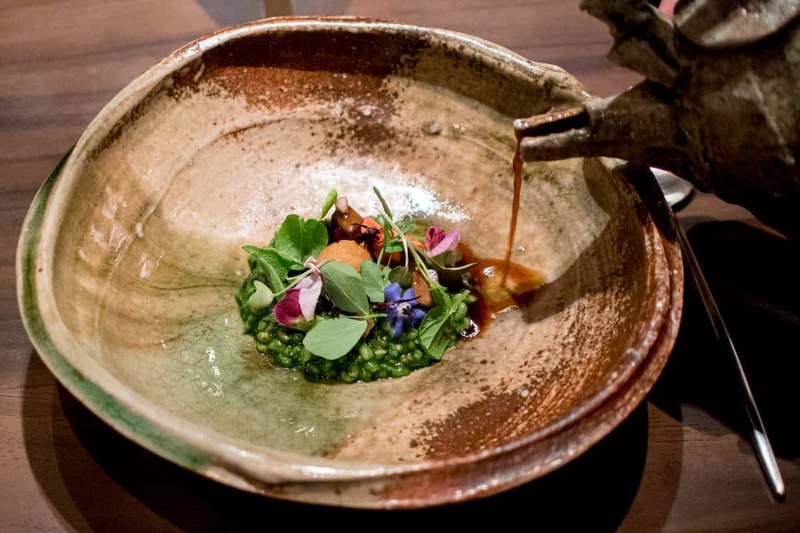 This next dish involved an extremely unusual preparation of foie gras. 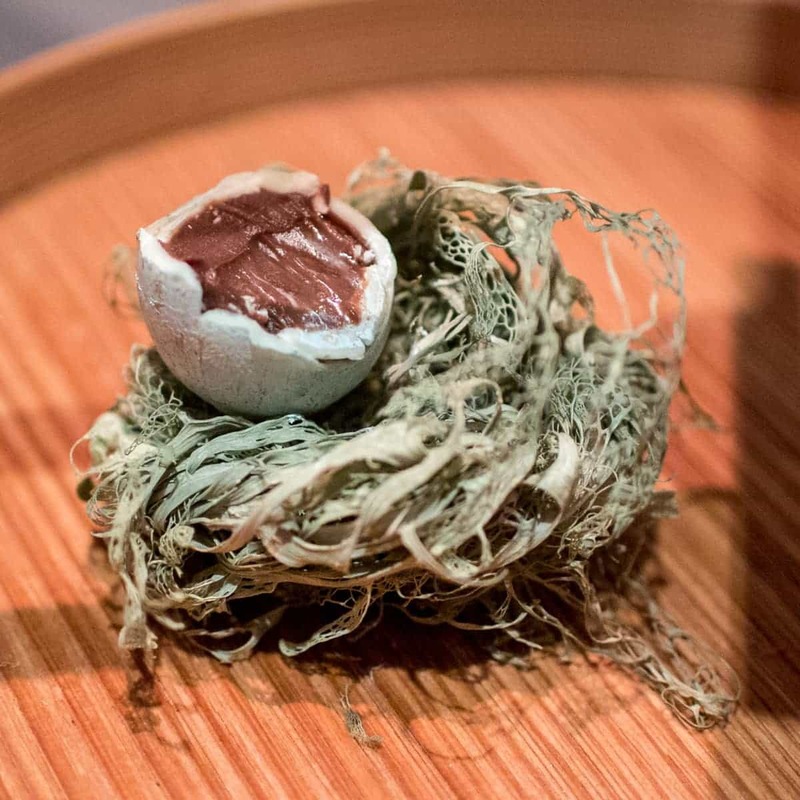 It was made up of a disc-shaped piece of foie that had been poached in — of all things — sea water. 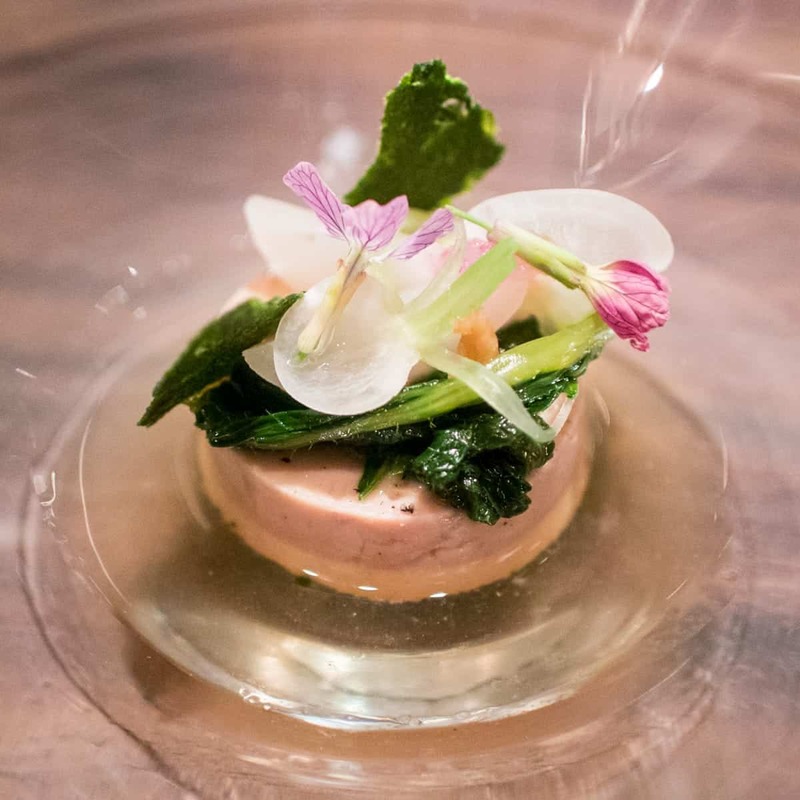 The rich, creamy, pâté had a light salinity from the poaching liquid which also formed the broth the foie gras was served in, which we absolutely loved. 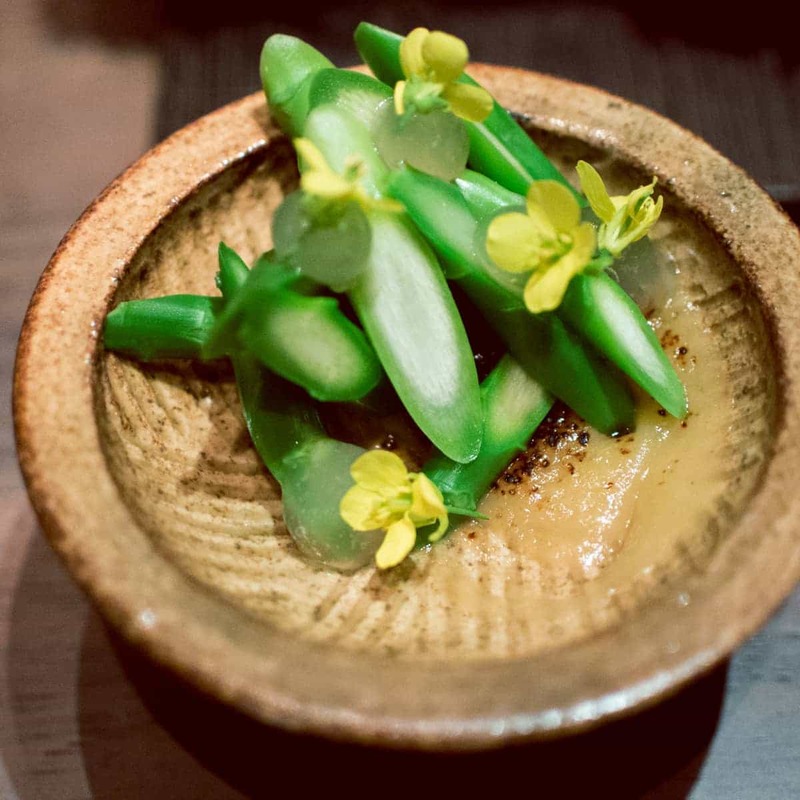 The umami flavor was amped up with a “tea of last year’s tomatoes”, Tokyo turnips, and their greens. I also loved the crisp, salty, squares of seaweed which contrasted amazingly with the creamy richness of the foie. 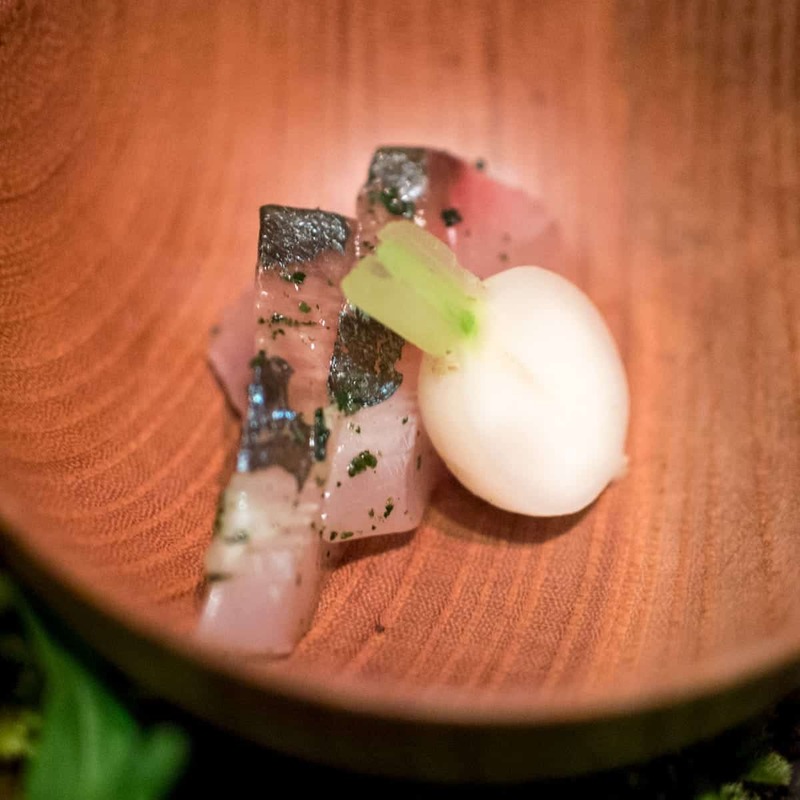 It was paired with the only beverage the sommeliers found could match the unusual richness and salinity of the dish — a sake produced on the Pacific Ocean — the Shizengou “Cuvee 18” Tarusake from Fukushima Japan. 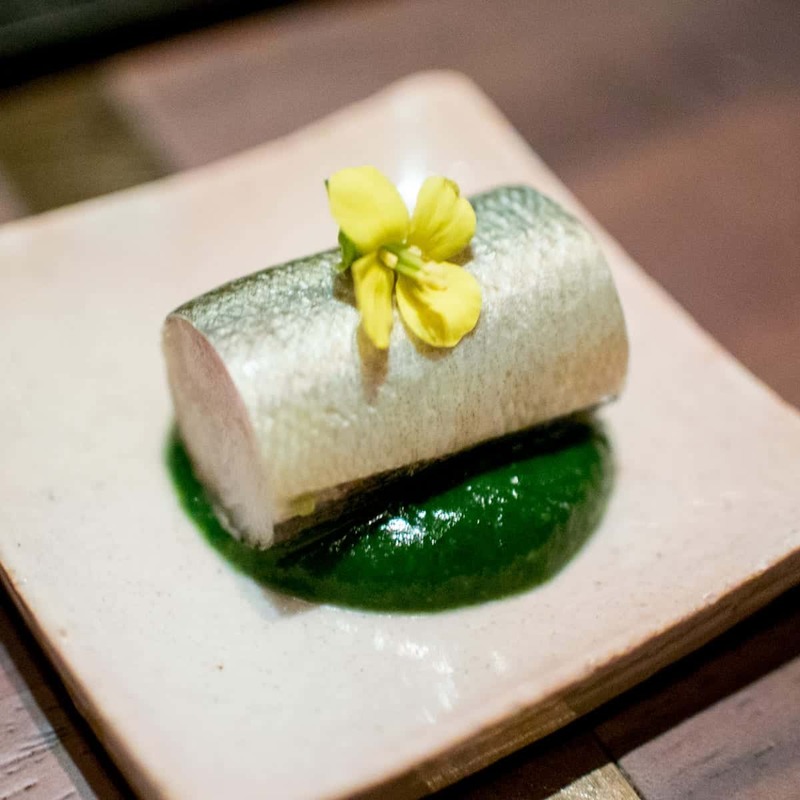 This dish was cooked in a traditional Japanese clay vessel similar to a Moroccan tagine. It was first presented to us in the tagine before returning to the kitchen for plating. 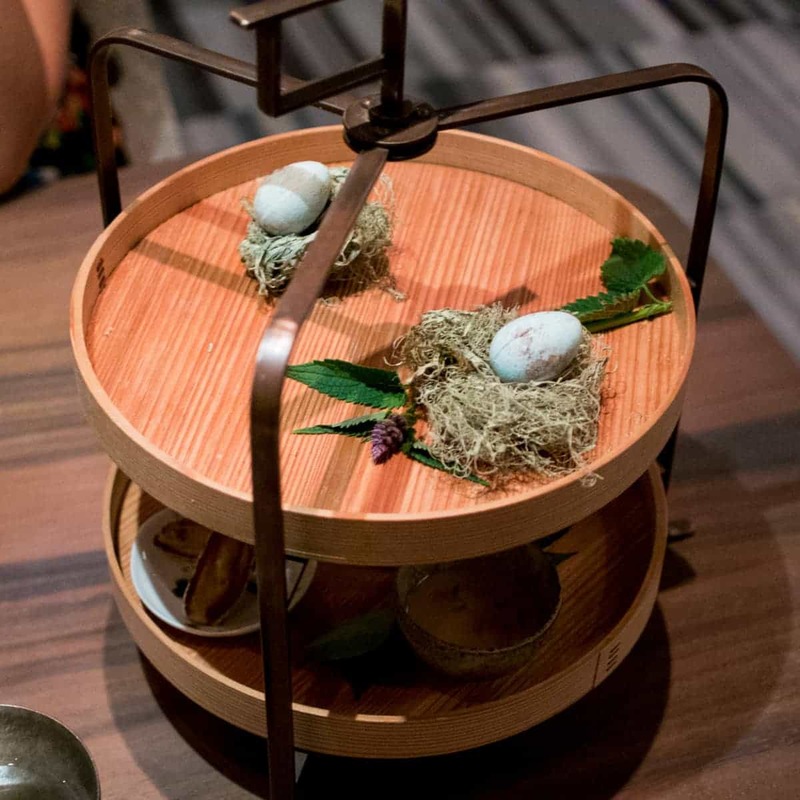 It returned to us in two individual portions which resulted in a tableside pour of a green broth made from a very rare Gyokuro tea. The fish was very delicate and had a mild pesto-like topping made from leeks and various vegetables from the garden. The vegetable sides were quite salty but paired well with the tame fish. 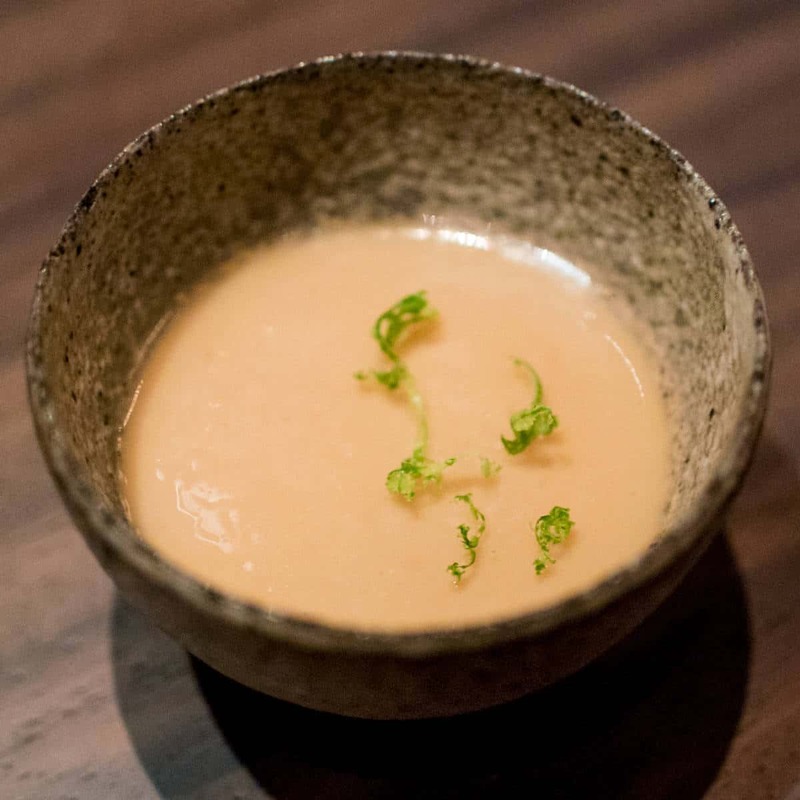 We especially enjoyed how the green tea based broth added vegetal nuttiness to the dish. It was paired with a relatively non-buttery 2014 Baxter “Oppenlander” Chardonnay from Mendocino, CA. Before this dish was presented, a server first brought over a wood box of gorgeous, specialty steak knives so that we could select the one that spoke most to us. The lamb meat was perfectly cooked — extremely tender with a tiny patch of crispy skin and a ton of smokiness ingrained from its time in the hearth. 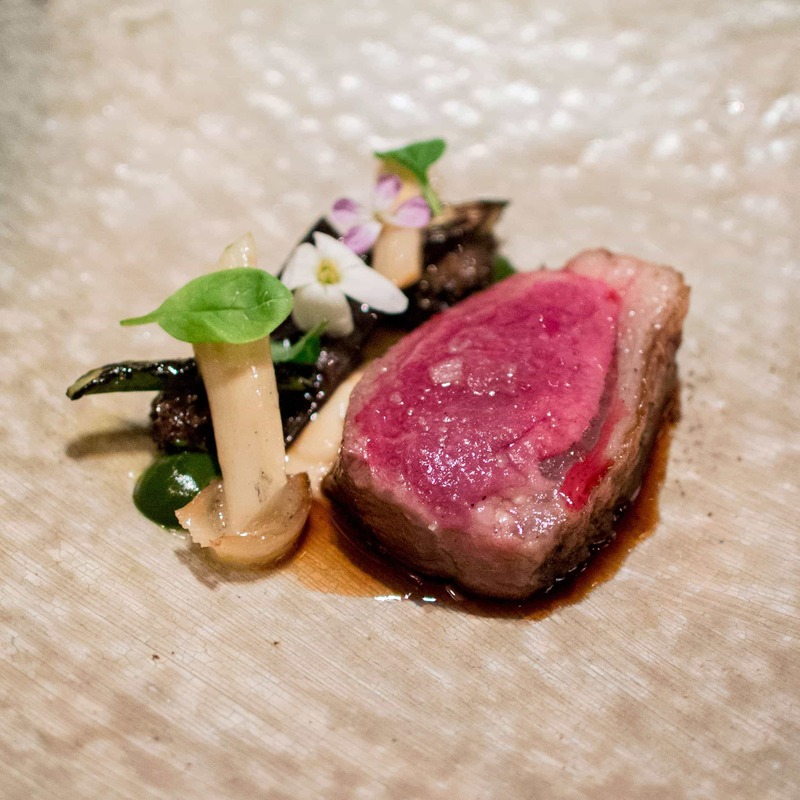 The combination of morel mushrooms, white and green asparagus, and green garlic paired wonderfully with the deeply smokey meat. It was paired with a dry, full-bodied 2006 Big Basin ‘Rattlesnake Rock’ Syrah from the Santa Cruz Mountains in CA. 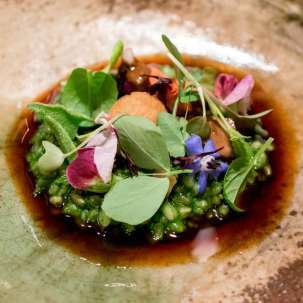 The final savory course of the meal was a rice-centric dish in which farro was prepared like risotto but interestingly took on a bright green hue through the use of nettles. 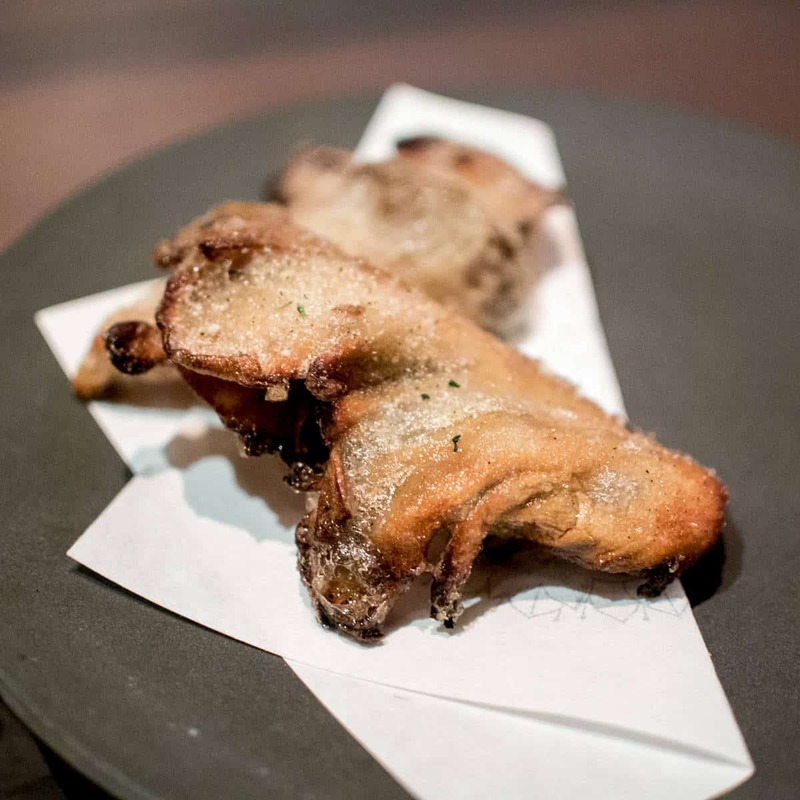 I loved the rich, heartiness from the hunks of tender, gamey lamb tongue as well as the item they called a beignet which was kind of like a potato puff stuffed with hearty lamb stew. This entire dish was incredibly satisfying and tasted a lot like a rich, rib-sticking lamb pot pie. It was paired with a bold 2013 Storybook Mountain “Eastern Exposures” Zinfandel from Napa Valley, CA. 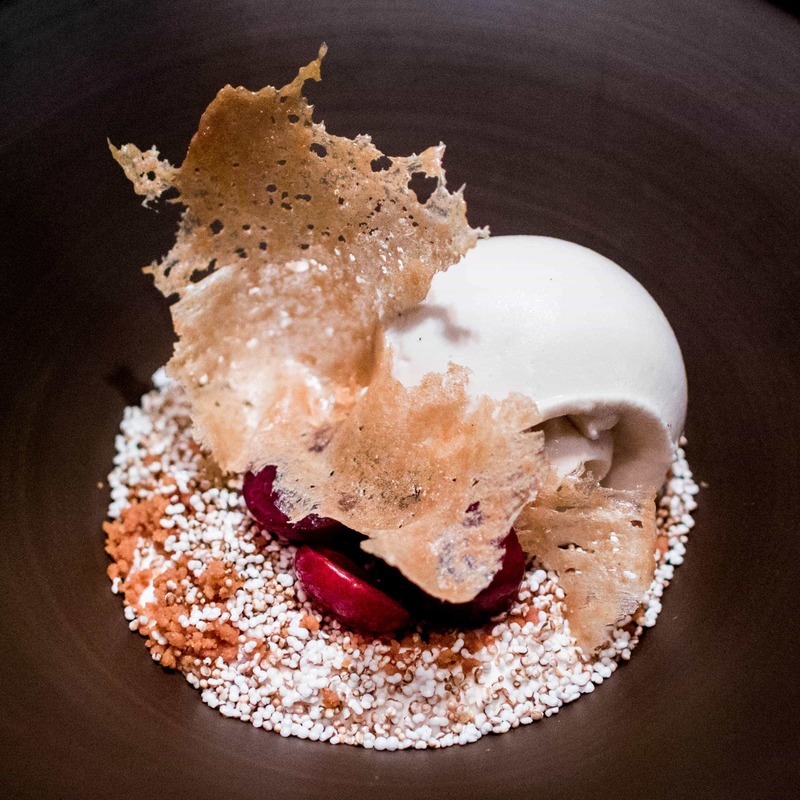 The first of our dessert courses had multiple textures and temperatures throughout its many layers. 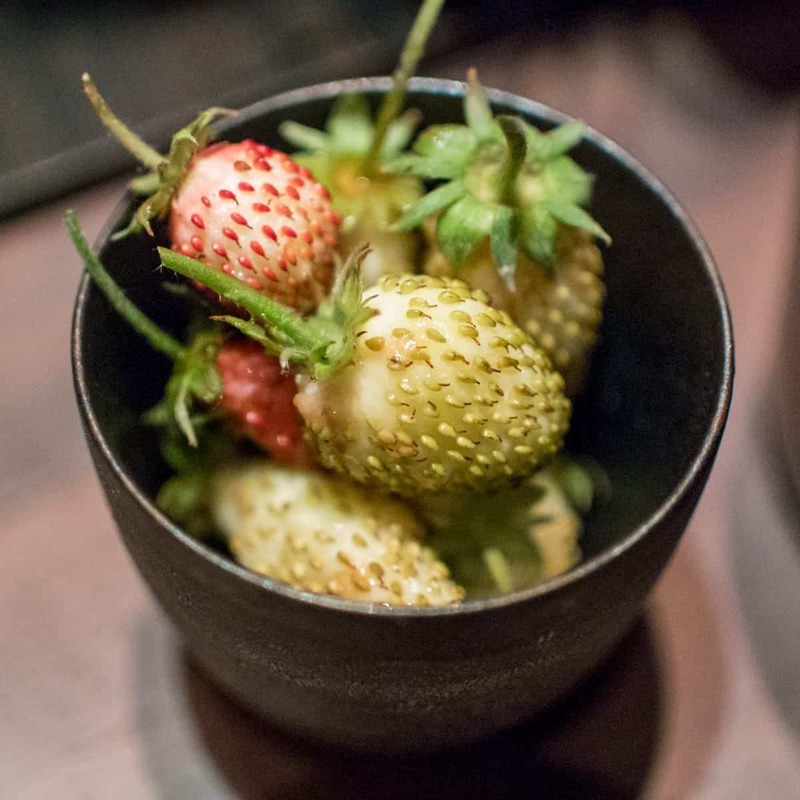 At the bottom was a bold and sweet strawberry compote with a citrusy lemon granita ice in the middle and an airy, crisp “cookie” made of grains of paradise on top. 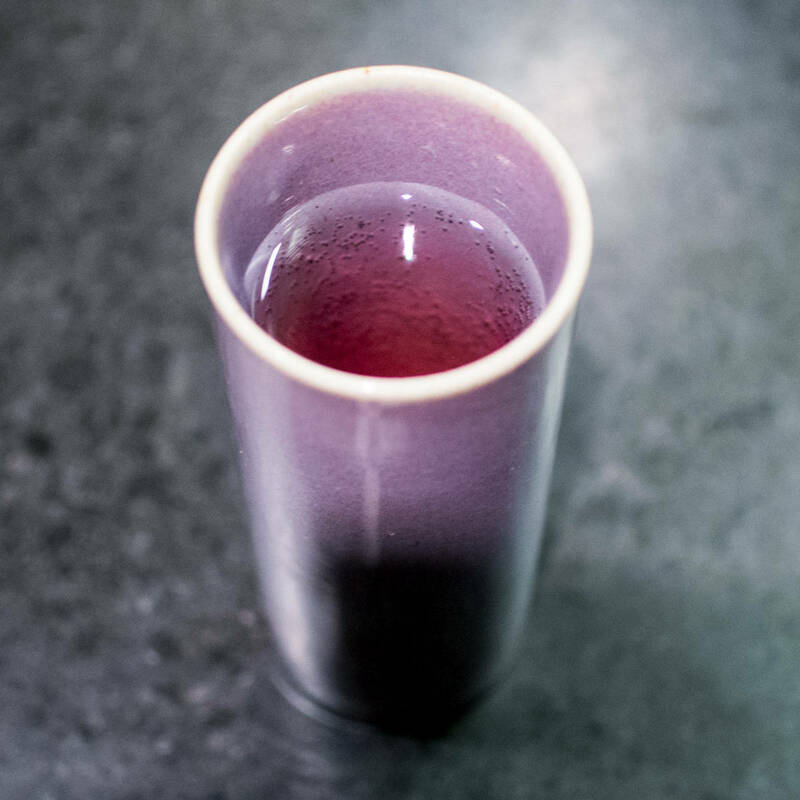 Along with the primary citrus and strawberry tones, there the was an extremely herbal flavor that I think may have come from the herb, sweet woodruff. 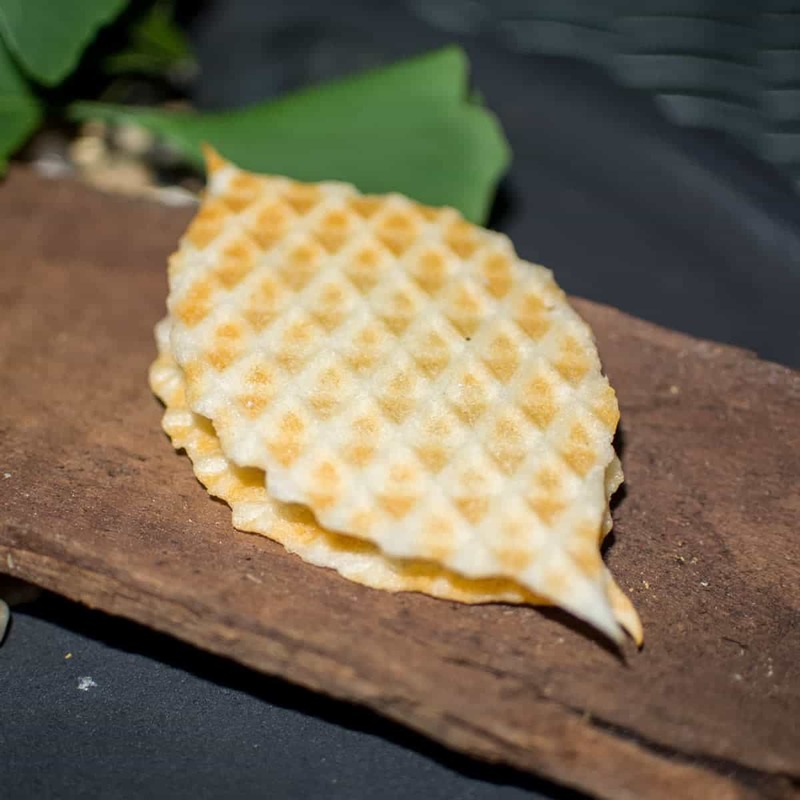 Next up was an unusual but truly irresistible creation that involved a scoop of super-rich brown butter-dressed Hojicha (green tea) ice cream served over a fruity apricot compote which was topped with puffed amaranth and a crisp nutty tuile. 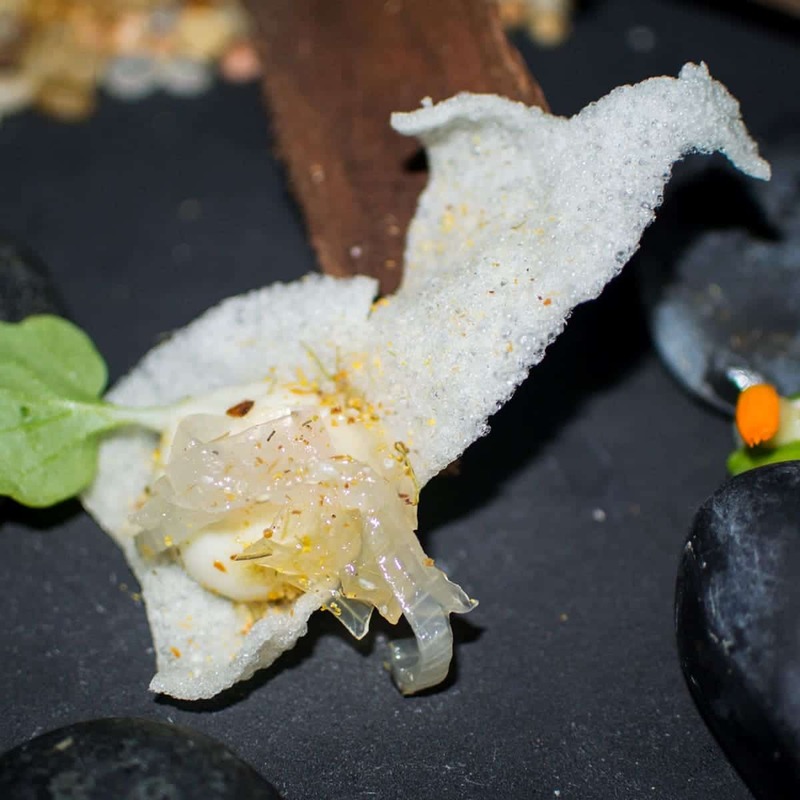 Puffed amaranth is sort of like micro-popcorn and brought a nutty, saltiness to the dish while the tuile added a crispy caramel note and earthy green tea-like nuttiness. It all came together unlike anything else I’ve ever had before — and was an insanely delicious creation. It was paired with a relatively sweet 2007 Navarro “Cluster Select” Late Harvest Riesling from Anderson Valley, CA. To cap off the meal, a final trio of sweets arrived on a pastry tower. 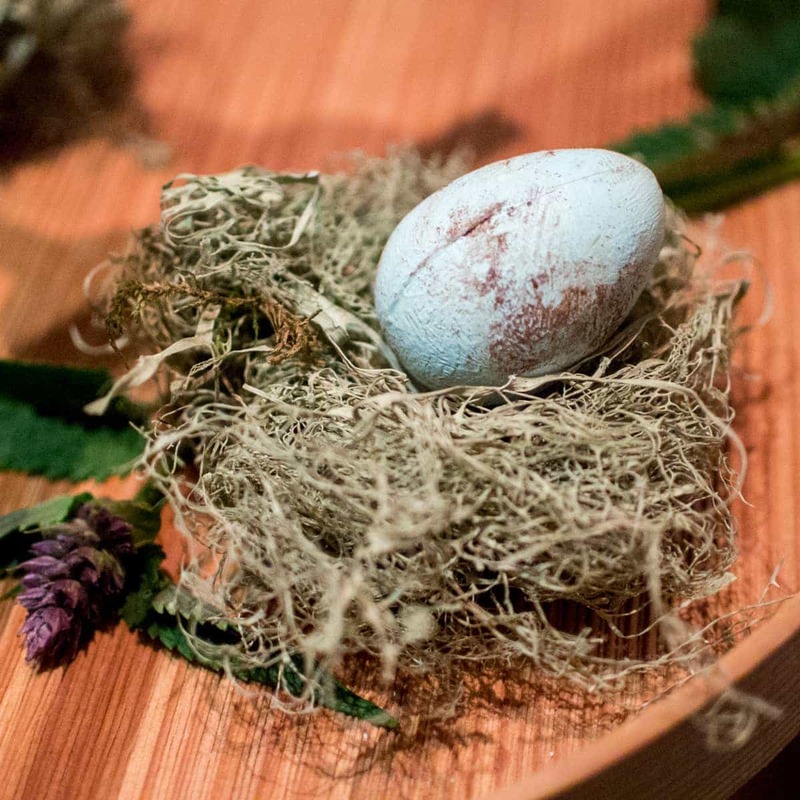 First, Spearmint — a blue robin’s egg which had a shockingly bold spearmint chocolate filling, but was actually quite lovely. Then, a Burnt Honey and Lime custard that was simply creamy and wonderful, but really came together because of the lime zest shavings. And finally, a Medjool Date and Miso that was soooooo weird in concept, but was actually really interesting and delicious. It was both sugary and sweet and simultaneously sour and funky — it was so unusual, but I actually loved the weirdness. After nearly four hours of careful service and meal and beverage curation, the meal finally concluded. But, there were still a few final touches worth noting. 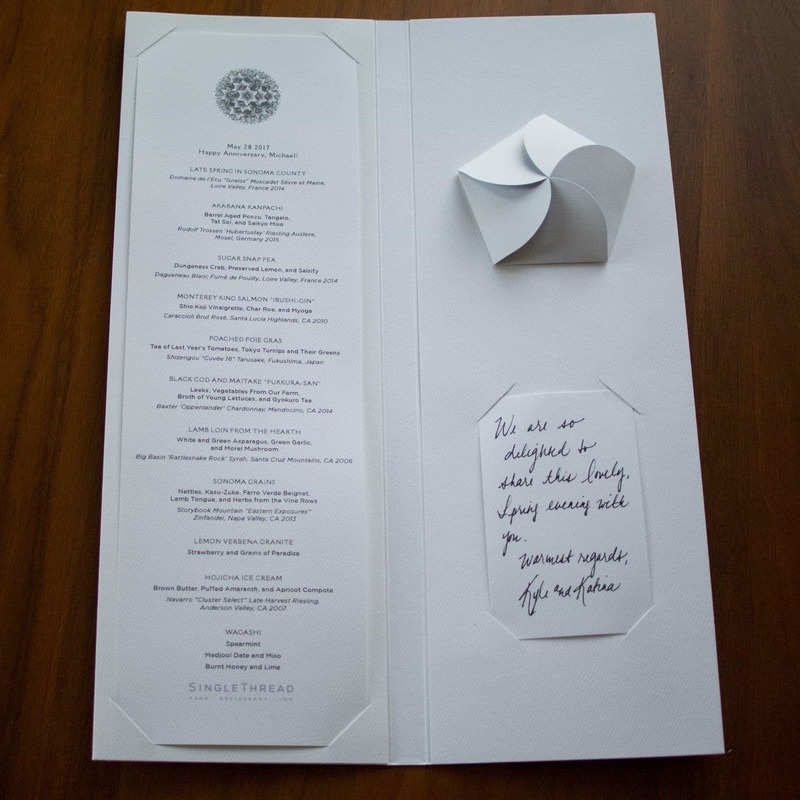 As we exited, we were presented with a beautifully printed flower-adorned booklet that had been printed with our personally tailored menu from the evening including the wine pairings, a message from the restaurant owners, and a curious folded paper pentagon. 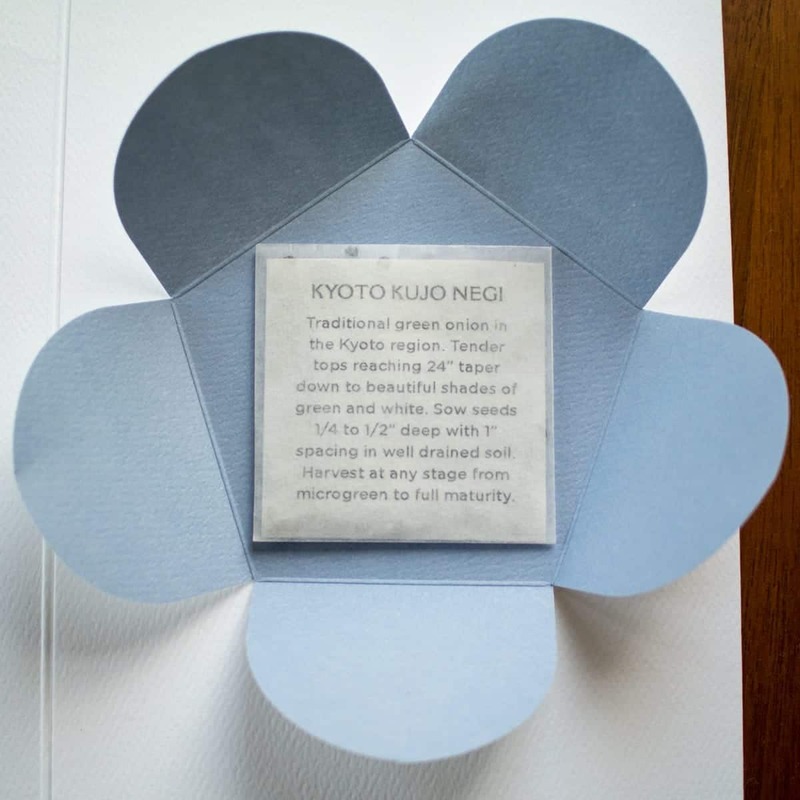 Inside the paper enclosure was something to bring this restaurant’s experience home — Kyoto Kuji Negi (Japanese green onion) seedlings to be planted in our own personal garden. That’s a pretty wonderful touch, if you as me.